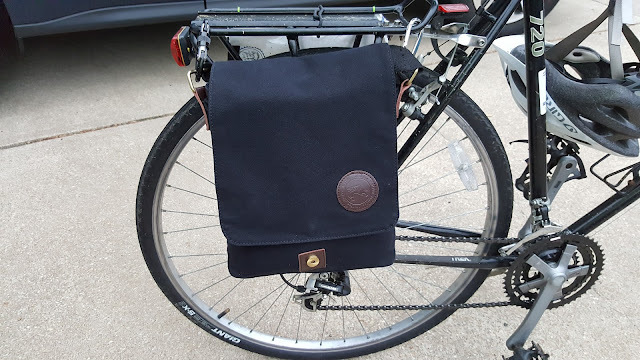 I'm always on the look-out for the perfect murse man-bag, so when one of the bags I'd been using started to rip, I had the perfect excused to try a new model. 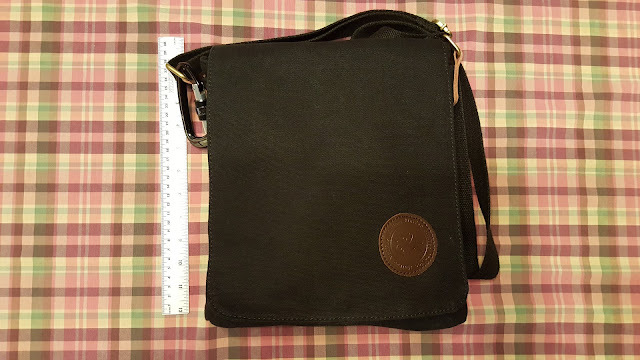 I give you the verbosely named: Ibagbar - Small Vintage Cotton Canvas Messenger Bag Ipad Bag Shoulder Satchel Crossbody Bag Hiking Traveling Bag for Men and Women. Got that? I think the size is about right. It's big enough to hold plenty of stuff (see below), but small enough to be out of the way. The styling is about as neutral as can be. It's a black canvas bag with a small brown patch on it. It's not some neon green sporty thing that's fine in the outdoors, but looks out of place in an office (not that I spend much time in an office). It's also not some formal leather thing that's overkill for carrying my crap around town. The simple fold-over-flap configuration is working well. It has a zipper on the main compartment, but I don't bother with it. I love that the bag has no Velcro and is silent to get into and has no zipper that can break. The magnetic closure on the flap works well, too. The build quality of the bag, especially considering it was $22, seems solid. The shoulder bag approach wears well in the heat. We took a hike yesterday and I carried the bag: whatever discomfort I had with a single shoulder bearing the weight was more than made up for with a cool back. Carrying a backpack during a DC summer is a guaranteed way to end up a hot sweaty mess of a back. Using two carabiners I'm able to attach the bag to my bike rack, turning it into a rudimentary pannier. I'm not blown away by the pockets in the bag. The one pocket on the outside is the biggest offender: it's just too small to hold my Galaxy 5 Note. The internal pockets aren't anything special either, and I'm not really sure what the designers had in mind for them. With that said, as you can see below, my stuff tends to be in their own little packages. 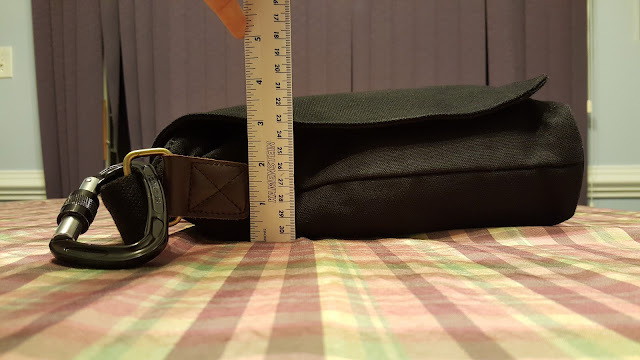 So having one large, functional pocket in the bag, works well for me. One disadvantage of having a canvas bag that's relatively well made is that it's heavy, at least when compared to other lighter-weight options. The part of me that is always thinking of ways to trim ounces just can't get behind canvas. That part of me is rooting my next buy to be the Z-Packs Multi-Pack. But canvas is durable and looks appropriate under a wide set of circumstances, so it's hard to argue with. At times I think the bag is too small. The problem: it's a bit too perfect a fit for my essentials. For example, I can't easily fit my DSLR into it or cram a large hard cover book that I've picked up at the library in it. This isn't the fault of the bag. The very thing that makes it work (it's relatively small size) is also what makes it questionable. I've had the bag for about 2 months now, and more often than not, the smaller size of the bag works. But still, perhaps my next bag needs an expand-o feature of some sort. When I travel, I won't be surprised if I turn to a larger bag, one ready to hold camera gear, guidebook, windbreaker, etc. The bag isn't invisible. This is another fact of life. Even with neutral styling, there's no doubt I stand out when other guys aren't carrying bags. But who wants to cram a Galaxy Note 5 into their front pocket of their jeans? And who wants to arrive somewhere and realize their phone is down to 15% battery and have no way to recharge it? And who wants to be stuck in traffic and be hungry enough to eat their own arm off, only to not have snacks on hand? Every time I leave the bag at home I get reminded that there's something in there that's handy. Oh yeah, that's why I carry the stinking bag in the first place. Still, black canvas or not, it stands out. Bottom line: the bag itself, especially accounting for the low price tag, really does deliver on what it promised. It's a small bag that looks about as plain vanilla as possible, and the simple large-flap design Just Works. 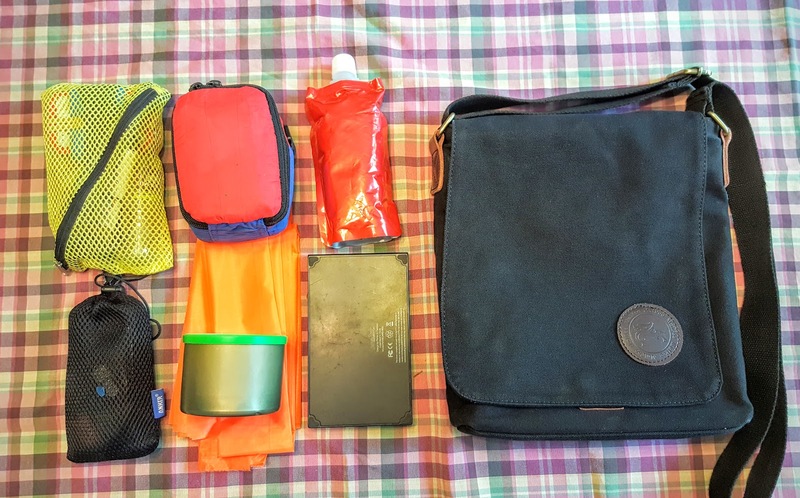 As a general purpose EDC bag, it's a winner. Red Zippered Bag: more odds & ends. 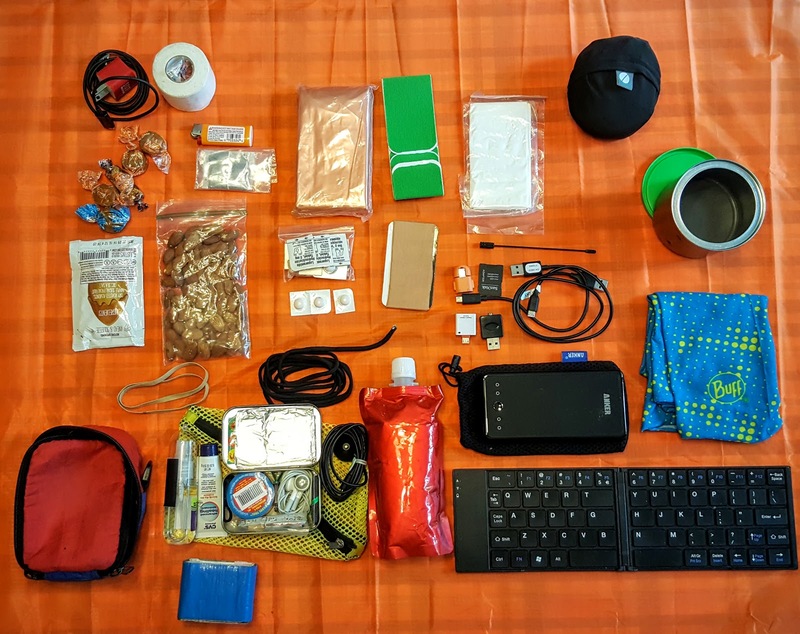 Contains snacks, various over the counter medications, various types of tape, a bic lighter, some TP, a heatsheet emergency blanket and a USB cable and wall plug. Red Flask: an 8oz soft flask holding, alas, water. I had pretty much dodged the trend of carrying a water bottle everywhere, and then I started getting in to the habit. Then I switched to a smaller bag and my usual 18oz bottle wouldn't fit in the bag any longer. I compromised with the 8oz flask. It fits perfectly and 8oz is surprisingly refreshing when you're thirsty. If nothing else, it's handy for taking pills or other times when you just need a quick nip of a drink. Metal Tin: filled with a Buff and Flip & Tumble shopping bag. The canister itself can be used for anything from a drinking cup to a protective hard shelled container. Black Sack: Electronics: Anker battery, USB and SD card related adapters and Software Defined Radio adapter. Orange Fabric: that's approximately 1x1 yard of bright orange parachute material. It's something I'm experimenting with carrying. Possible uses: signal panel?, Furoshiki? A mini picnic blanket? A seat cover after an especially muddy run ? We'll see. It folds up and sits along the bottom of the bag taking up little space. Whoa, that's a lot of stuff. I guess that's what you get when you tune your gear for 30 years or so. Check out my bag dump from two years ago, to see what has, and hasn't changed.